Glasgow Prestwick International Airport (IATA: PIK, ICAO: EGPK) is a facility situated north of the town of Prestwick in Ayrshire, Scotland. Although officially called Glasgow Prestwick International Airport because Glasgow, Scotland's largest city, is only 46 km (29 miles) North-East of the airport, most people, particularly locals, refer to it simply as Prestwick Airport. In physical terms, Prestwick remains Scotland's largest airfield, although in passenger traffic terms it sits in third place after Glasgow's main airport, Glasgow International and Edinburgh Airport, both of which are operated by BAA. The airport began life around 1934 — primarily as a training airfield — with a hangar, offices and control tower being in place by the end of 1935. The airports original owners were David McIntyre, who was also the owner of Scottish Aviation with backing from the then Duke of Hamilton. With the onset of World War II, the airport developed rapidly in order to handle the large volume of American aircraft ferry traffic. In 1938 passenger facilities were added, which were used continuously until the implentation of a massive investment programme to make Prestwick compatible with the new jet transports which were becoming available. A runway extension, parallel taxiway, link road, and an all-new terminal building were opened by the Queen Mother in 1964. Scottish Aviation built a factory using the original terminal building and hangers at Prestwick, which produced such aircraft as the Jetstream and Bulldog. One part of the factory, the large white stone building which remains to this day, had in fact been the Palace of Engineering that had been part of the Empire Exhibition in Bellahouston Park in Glasgow in 1938. When Scottish Aviation went bankrupt and were merged with British Aerospace, BAe maintained aircraft production at the site until 1998. Today the factory produces components for Airbus aircraft, as well as Jetstream maintenance work. In the beginning, Prestwick was the only Scottish airport allowed to operate a transatlantic link, largely due to the very benign weather conditions on the Ayrshire coast. Indeed, with a much lower incidence of fog than any other airport in Great Britain due to a geological anomaly, Prestwick is the only guaranteed fog free airport in the UK. This is perhaps one reason it managed to avoid total closure when it appeared that BAA seemed to be running down operations. It was also partly a political decision to silence those that questioned why Glasgow needed two airports when Glasgow Corporation had already invested money building Glasgow Airport. Although British Airways had ceased regular passenger operations in the late 70's which some people saw as the beginning of the end for the airport, BA continued to intermittently use Prestwick as a site for pilot training, especially for training Concorde pilots. Concorde became a semi-regular visitor to the airport, and indeed BA and a number of other major airlines still use Prestwick for pilot training. Prestwick Airport is also famous because it is the only piece of British territory that Elvis Presley set foot on, when his US Army transport plane stopped to refuel in 1960, whilst en route from Germany. In 1991 the newly-privatised British Airports Authority, BAA plc consolidated their portfolio of UK airports. Part of this was to move all transatlantic traffic departing from Scotland to Glasgow Airport, near Paisley, and sell Prestwick off to the private sector. In the early-to-mid 1990s passenger figures fell sharply with only freight traffic and a small number of charter flights using Prestwick on a regular basis. At this point the airport faced an uncertain future. 1994 marked the beginning of a renaissance for the struggling airport. It took the shrewd move and built its own railway station on the existing Glasgow-Ayr line, which ran straight past the airfield. Then, Irish budget line Ryanair opened a route to the airport from Dublin. This led to another route to London the following year. The resulting rapid growth of European no-frills airlines in the late 1990s has seen Prestwick grow even larger than it had ever been in traffic terms under state ownership. Ryanair now offers 19 different destinations from Prestwick - now one of their maintenance hubs - and other budget airlines have moved into the airport. Today, as well as the thriving no-frills segment, Prestwick has continued its traditional strategic role as a refuelling point for military aircraft - the US Air Force and the RAF are frequent visitors for example. Cargo traffic has also become another stronghold of Prestwick with the vast majority of Scotland's Boeing 747 Freighter traffic entering via the airport. The airport is privately owned by Infratil, a New Zealand investment company which also owns Wellington International Airport. 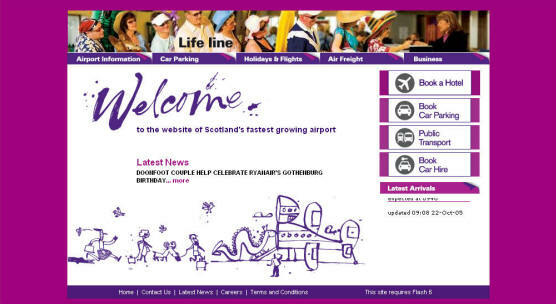 In April of 2005, Infratil completed a major £3m refurbishment of the terminal building, and also controversially rebranded the airport using the phrase "Pure Dead Brilliant", taken straight from the Glasgow Patter. On 6th July 2005, Prestwick Airport became the entry point into Scotland for the world's most powerful leaders on the eve of the G8 Summit which was being held in Gleneagles. Strathclyde Police implemented an unprecedented level of security around the airport for the duration of the summit. Officers from police forces throughout the UK were drafted in to assist in the operation, including armed officers. In preparation for the landing of Air Force One, carrying American president George W Bush, the A77, which runs past the end of the main runway, was controversially closed while the aircraft was on final approach. The main scheduled carrier at Prestwick is Ryanair, operating the vast majority of flights from the airport. The only other scheduled carriers are Aer Arann and Air Wales, on behalf of bmibaby. Holiday airlines operating from Prestwick vary seasonally, but include My Travel, Britannia Airways, Balkan Holidays and LTE. Flights are normally operated to Spain, Portugal, Bulgaria and the US. Regular freight operators include Cargolux, Polar Air Cargo, Atlas Air, British Airways World Cargo, Air France Cargo, and Singapore Airlines Cargo - all operating Boeing 747-400F aircraft, with Polar Air having a maintenances hanger at the airport. Air Foyle HeavyLift and Volga-Dnepr are also occasional users of Prestwick with Antonov An-124 aircraft.